Completely updated to include the most recent developments in the field, the third edition like the two previous editions, emphasizes clarity and thoroughness in the mathematical development of its subjects. It is written in a style that is free of jargon of special applications, while integrating the three important functions of geometric modeling: to represent elementary forms (curves, surfaces, and solids), to shape and assemble these into complex forms, and to determine geometric properties and relationships. With hundreds of illustrations, this unique book appeals to the reader’s visual and intuitive skills in a way that makes it easier to understand its more abstract concepts. 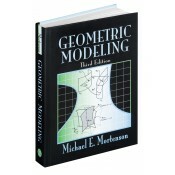 • Describes and compares all the important mathematical methods for modeling curves, surfaces, and solids. • Prepares the reader for more advanced topics, such as 3D modeling, CAD/CAM, animation, and scientific visualization. • Incorporates references throughout the text to direct the reader to more specialized treatments of the subjects. • Carefully designed illustrations and exercises support each mathematical concept presented. • Offers hundreds of exercises to test the reader’s comprehension. • Answers to Selected Exercises.